Kent home and business owners get huge incentives to build or remodel... get the info! Kitchen Remodeling is a great investment in your home, and will be enjoyed every day. By remodeling your kitchen you can add value to your home and at the same time save money with energy efficient kitchen appliances. Let’s face it, the kitchen happens to be the most used room in the house, mainly because it is the center of food and drinks. When guests are over visiting your house, they are instantly attracted to the room with the food and drinks. Before the guests arrive, you are in the kitchen preparing the food and drinks. Due the fact that so much activity takes places in the kitchen, a special design called the “kitchen work triangle” was developed to make moving around in the kitchen much more efficient . 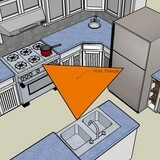 More specifically, the work triangle refers to the triangle created between the stove, the refrigerator, and the sink. Other major work stations exist within this triangle, such as your countertops, microwave, dishwasher, etc. The idea behind the work triangle is to create a short and comfortable distance between all the major areas of the kitchen in which you will be moving back and forth from. If your current kitchen design makes you feel like you are in a constant fight with the kitchen just to make a sandwich, then you may want to look into a kitchen remodel. Sometimes, a simple change can be made to make the kitchen more user-friendly. However, sometimes a major change must be made such as moving your sink or range. If you are thinking about remodeling your kitchen, give us a call to set up a free, no obligation, in-home evaluation.